Authors: C Scannapieco et al. The first “computer simulation” of structure formation, in 1941, used 37 moveable lightbulbs to mimic gravity’s inverse-square force law. 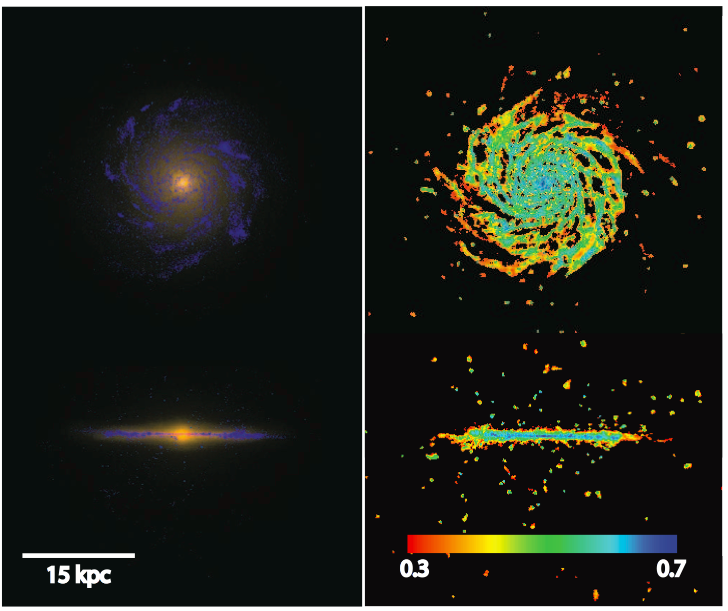 Modeling galaxy formation has come a long way since then! Today, I will discuss the Aquila comparison of many of the major codes currently used to simulate galaxy formation. Published in 2012, this paper is important because simulations are one of the only ways we can do experiments on Galaxy-scales: begin with initial conditions, add in our best understanding of physical processes like supernovae, stellar winds, active galactic nuclei, and star formation, and see what unfolds. Comparison of different simulation codes is critical because it should show what aspects of the results are from the physics and what are from the algorithms used to compute the physics. The ultimate test of science is how it stacks up against observation. The Aquila project compared 13 different runs with 4 different codes, with some runs using different prescriptions for feedback but the same code. Unfortunately, none of the runs duplicated a spiral galaxy that agrees well with observations. Most runs rather form messy, bulgy galaxies, and of those that do form spirals, the gas is too concentrated towards the center of the galaxy, leading to unrealistic rotation curves and failure to satisfy the Tully-Fisher relation, which connects rotation speed with amount of mass in stars (see two figures below). This shows how much angular momentum in the z-direction there is vs. what is expected if the gas is rotating; you want a value >0.8 to have a disk. One can see for most galaxies from Aquila, this doesn’t happen: the bulk of the distribution’s area is to the left of 0.5 for almost all cases, meaning most of the gas in the galaxy is not rotating but just whizzing around randomly. From the paper. 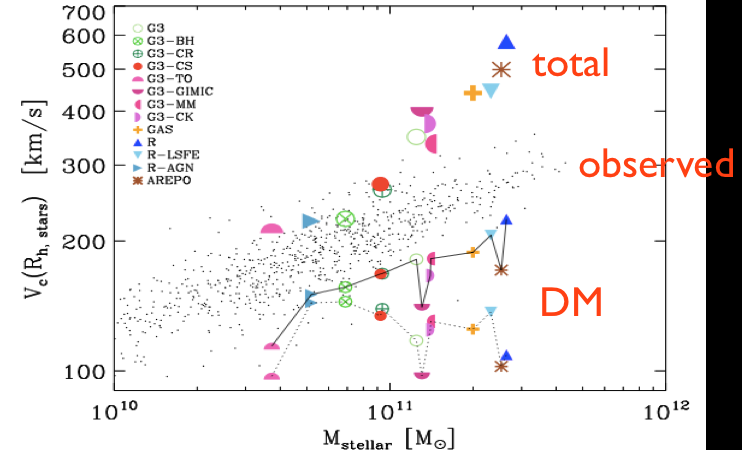 This plot shows that the galaxies don’t reproduce the observed Tully-Fisher relation, and that this is due to the regular matter, because the DM (dark matter) is not below the observed relation and so not the culprit. From the paper, with orange annotations added by me. These problems relate to angular momentum and star formation. To form a gas disk, you need to have enough gas left over from star formation to do it. That means you cannot have too much star formation early on, at high redshift. But on the other hand, to form a disk you also need a large fraction of high angular momentum gas that has rotational support. To get this, you need some way both to i) filter out the low angular momentum gas that’s already accreted onto the galaxy and ii) preferentially accrete only high angular momentum gas. Pulling things together, then, in all of the Aquila simulations, there was too much star formation too early, leaving little gas for the disk. Further, there was not enough high angular momentum gas, leading to excessive compactness, which in turn produced the unrealistic rotation curves and poor agreement with the Tully-Fisher relation. These problems are known as overcooling and the angular momentum catastrophe, and are causally related. 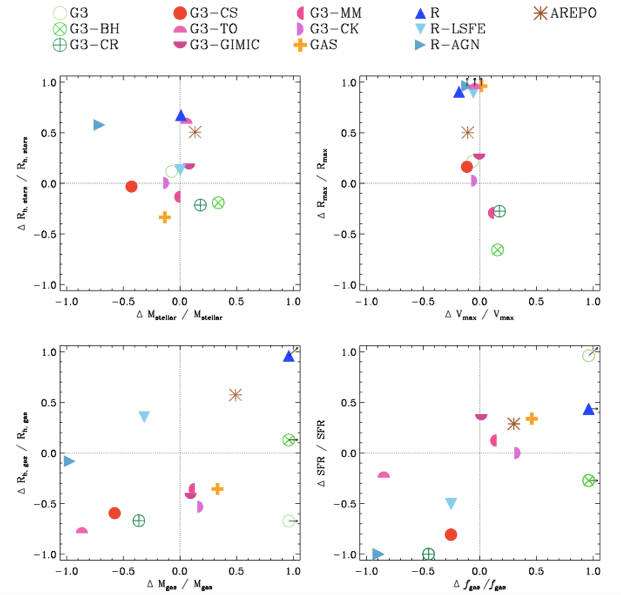 If too much star formation occurs at early times, it is because gas has cooled too efficiently—something that can occur in the absence of correct feedback. As the gas cools, it transfers its angular momentum to the dark matter (DM), consequently falling inwards. So overcooling produces the angular momentum catastrophe. And ultimately, overcooling itself traces back to feedback. Feedback is a bit of a dirty word to the theorist: it is typically invoked as an answer for anything. There’s a reason for that; baryonic processes like supernovae, active galactic nuclei, black holes, and stellar winds involve a wide range of time, length, and energy scales and are non-linearly coupled to each other, so they are difficult to predict or simply understand on paper taken together. Thus, they really could be the answer to all one’s problems—or not! Only simulations really can tell. But unfortunately, simulations cannot resolve the actual feedback events, and so rely on “sub-grid” prescriptions for the causes of feedback. These prescriptions are just simple “if then” statements: e.g. if a density threshold and temperature threshold is reached, form a star, or, if a star is old enough, let it supernovae with some probability distribution. They are called sub-grid because they apply to scales smaller than the grid size of grid-based simulations, or the smoothing length for smoothed particle hydrodynamics ones. * A simulation is only as good as these prescriptions—which consensus acknowledges are all too simplistic and in detail incomplete. In the end, then, solving the problem of disk formation in galaxies can only come from accurate feedback modeling. At current, because the feedback is uncertain, simulations do not even agree with each other—there is a wide range of results in the Aquila project between simulations that have different feedback. And even worse, simulations change significantly when run at different resolutions, meaning they probably have not converged to the true answer (see figure below)! This shows the fractional change in two different quantities as the resolution is changed. Converged answers would imply points at (0,0)—notice that doesn’t happen, meaning physical quantities like gas mass, gas fraction, and stellar mass change a lot when you change the resolution. Note that even points at (0,0) wouldn’t mean the runs are converged: to study convergence at least 3 different resolutions should typically be used. From the paper. But let me close on a note of hope: recently, Guedes, Callegari, Madau, and Mayer did a simulation called Eris (cool video here!) with a much higher density threshold for stars to form. This made the regions with stars much more clumped and inhomogeneous, totally changing the feedback and the feedback’s effect on subsequent star formation and gas/angular momentum accretion and retention. 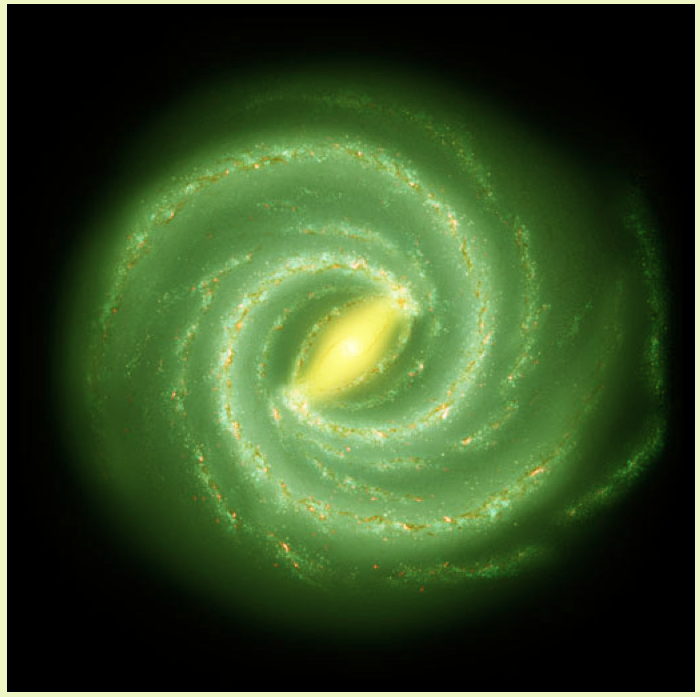 They produced a realistic spiral galaxy (see figure below), suggesting that feedback can solve the angular momentum problems. 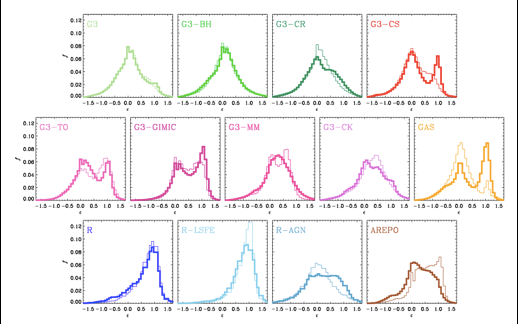 But much more work is required, as the authors acknowledge, to get higher resolution runs to study the convergence and hopefully even eventually resolve the mechanisms that now must be modeled by sub-grid prescriptions. Simulated images (what you might observe with a telescope) of the Eris simulation’s result. Look how realistic this galaxy appears: just like typical pictures of the Milky Way. From the Eris paper. *Simulations of galaxy formation all must track i) the evolution of the matter and DM under gravity as well as ii) the evolution of the regular matter as a fluid. All of the codes used “tree” algorithms to solve the gravitational evolution (i)). In these algorithms, the particles are grouped to different levels of a tree depending on how close they are to a given particle. To calculate the force, the particles in farther away groupings are treated as larger groups, speeding up the computation. The evolution of the fluid (gas) in the proto-galaxy (ii)) is done with either smoothed particle hydrodynamics (SPH) or grid-based methods. In the former, the fluid properties, like density and temperature, are sampled by “particles” and then smoothed, while in grid-based methods, the fluid quantities are calculated at points on a grid. The particular method a code uses to solve the fluid dynamics can be important because grid-based codes and SPH handle certain situations differently. For instance, SPH does not correctly capture certain types of instabilities, and both methods have challenges resolving shocks. For what it’s worth, that analog computer paper is fun too: Holmberg E., 1941, “On the Clustering Tendencies among the Nebulae. II. A Study of Encounters between Laboratory Models of Stellar Systems by a New Integration Procedure”, ApJ 94, 385.